This is the moment a man wrestled a 200kg bull to the ground on a busy highway after it had escaped from a truck. 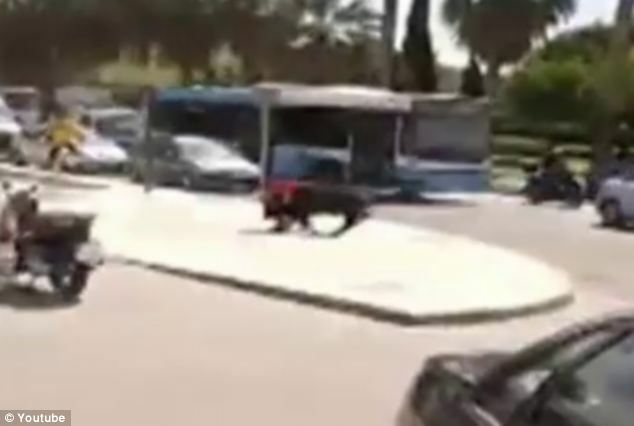 The beast bolted from the vehicle on Monday morning and spent more than 60 minutes charging cars in Malaga, Spain. Footage filmed by a passerby shows the young animal, believed to be two-years-old, scuffing his hoof and running towards a police cruiser. He is also seen wandering around the street, as drivers do their best not to get in his way. The incident came to a dramatic conclusion, however, when he turned around to find one of his handlers – dressed in a red T-shirt – enticing him forwards. The bull started to run and – as he got close – the man dropped to the floor, grabbing him in a headlock and holding him down. 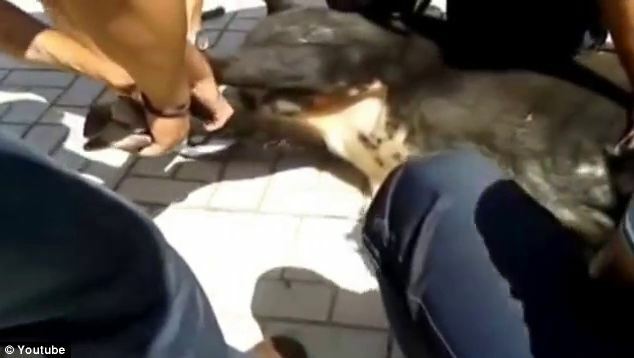 He was then joined by passersby and National Police officers in securing the animal with rope around its legs. A police spokesman told La Informacion that the bull had dented four vehicles and injured an officer who helped in the operation.